There are days when I wake up when I simply don’t have the time to fuss with the curling iron, blow-dryer and everything else involved. My go-to hairstyle in this scenario is a simple, low bun – sometimes messy, sometimes tight and neat. Either way, in less than five minutes my hair can be up, done and ready for work or something fun. And because one never knows what the weather may be up to or what the day will bring, I always have hair elastics and jumbo bobby pins in my tote or pocket to create this look on the go as well. 1. Use dry shampoo on the roots to soak up excess oil. Brush through. 2. Use Bumble & Bumble’s Dryspun Finish to the roots to add volume. 3. If adding a part, use a comb or pick to create a straight or purposely messy line. 4. Add a bit of body to the crown with a touch of backcombing. 5. Sweep hair into a low ponytail at the nape of your neck. 6. If you have fine hair like myself, using a comb or brush, backcomb the ponytail, use a spritz or two of hairspray to hold the volume. 7. Twist the ponytail and then wrap around the ponytail holder. 8. Use jumbo bobby pins (or regular size depending upon your hair texture) to hold in place. I usually use three and place at the three points of a triangle. 9. 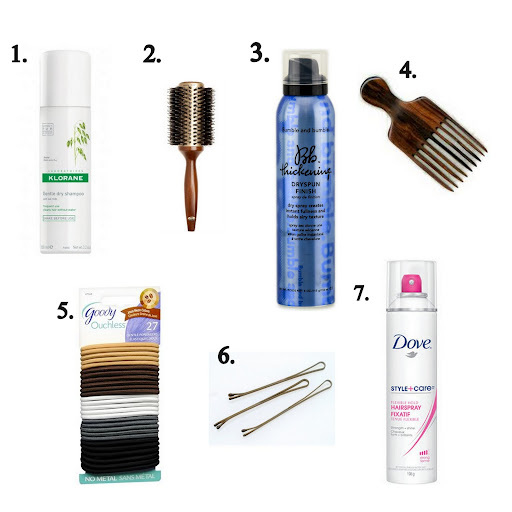 Use hairspray for any fly-aways or pull a few strands to create a messy finished look. Awe, Norman kissing Mom bye or hello! That last shot is stunning! Would love to hear more about your hair/makeup routine. Love your dress and the purple is amazing. Where did you buy it? Looks fantastic, great product tips!